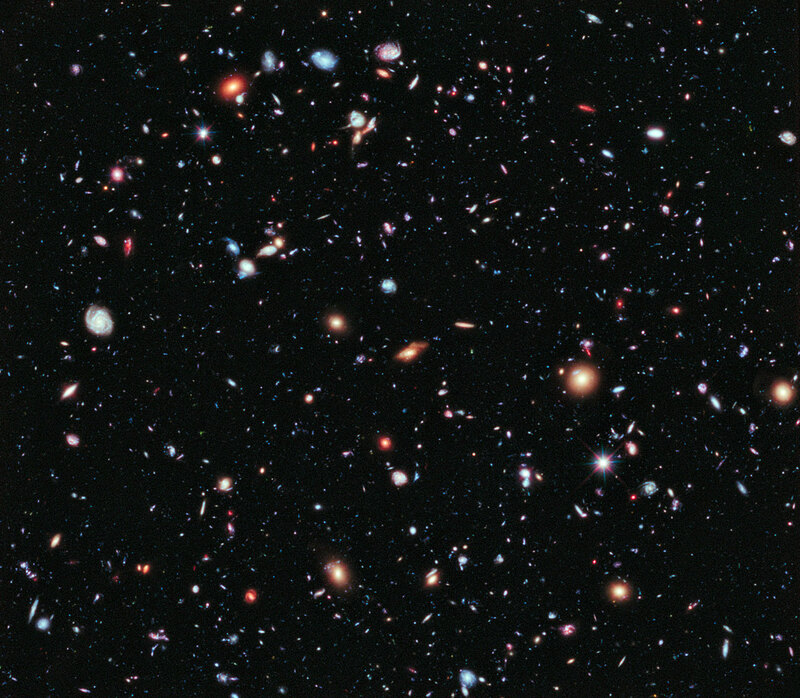 This entry was posted on September 27, 2012 at 1:25 pm and is filed under The Universe and Stuff with tags eXtreme Deep Field, Hubble Deep Field, Hubble Space Telescope, Ultra Deep Field. You can follow any responses to this entry through the RSS 2.0 feed. You can leave a response, or trackback from your own site. I’m not sure how big this is, but the original HDF is about the same angular size as a rice grain held at arm’s length. Think of all the galaxies in this area of the sky, then extrapolate to the whole sky. That’s the observable universe. Of course, other areas will have more foreground objects. Forget gravity for a minute and compress this to the density of something we understand well, namely nuclear matter. How big is the ball? Matter content of the observable universe is ~1E53 kg so at nuclear densities it would be a ball of radius a few A.U., I reckon. Yeah, space is pretty empty. It would be very interesting to try to do some science with that data set. Good luck to everyone in a position to do.